This is the shiny new offering from Dell. It is released for some time and offer’s Intel’s latest Core i3 processor. So some may be wondering that what’s this core i3? 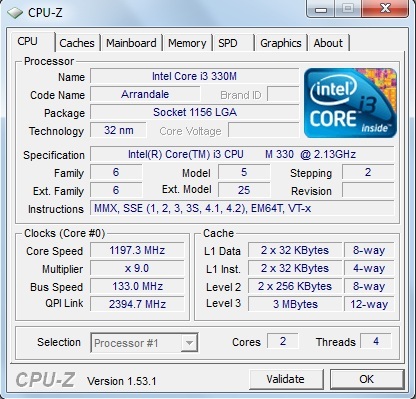 Well, in simple terms, its the new 2010 offering from Intel, codenamed as “Arrandale”. Core i3 has two cores, with four threads running, 3 MB L3 Cache and is a 32 NM based micro processor. Yes its 32 NM compared to processor’s like Core 2 Duo which are 45 NM. So now I think it’s no point in buying a Core 2 Duo or Dual Core laptop. But afterall, everything depends on your budget. So let’s start the review of the all new Dell Inspiron 1564. It’s core i3 so you can expect good performance from this laptop. It’s very good for normal home and office use. Tried running Internet Explorer with 6 tabs, msic playback and a movie, this laptop can surely handle this all with no problem. Also the inbuilt IGP is capable of running Full HD movies without any problem. When tested by running Need for Speed: Carbon, the game didn’t ran too well. The game was running with the smallest resolution and was also centered. So you can say that this laptop is not meant for gaming, but it can run some old games. The heat vent is in the left hand side and sometimes it throws out really hot air, so never try to block this heat vent. The keys sometimes become somewhat hot but then again this happens in mostly all laptops, so it’s normal. Wi-Fi reception is also very well, and never faced any problem in the reception. It’s Dell, therefore you can customize the configuration and color also. The color choice includes Obsidian Black, Passion Purple, Ice Blue, Promise Pink and Cherry Red. Total battery running time is approximately 2 Hours and 45 Minutes (Tested by running Internet and Microsoft Office). This baby rocks in this regard also. It has a resolution of 1366 x 768, which is a HD (720P) resolution. Watching HD videos is a pure pleasure, it’s crisp and clear. This is where this Dell Inspiron 1564 hits the sweet spot. It’s price in India is 32,799 Rs (Which includes all taxes and delivery charges). Again I should say it’s very reasonalby priced. This small baby can handle it all, just try throwing everything. But again I would like to say that it’s not meant for gaming. But it can handle Full High Definition movies very well without any problem. It’s the best bang for money laptop. This laptop would be a great buy if Dell coupled this with 3 GB DDR3 RAM and 320 GB hard disk. If you are thinking to buy a new laptop with good performance then this one for you. This is great computer, good review.